The toll from ever-more intense floods, drought, and heatwaves will crescendo this century unless humanity anticipates the onslaught, according to a UN report set to be unveiled on Friday. In an 800-page assessment, the Nobel-winning Intergovernmental Panel on Climate Change (IPCC) says global warming will magnify the frequence and force of extreme weather events, and defences must be prepared now to avoid worse misery in the future. "The character and severity of impacts ... depends not only on the extremes themselves but also on vulnerability and exposure," notes a draft "summary for policymakers" obtained by AFP. The 20-page document is being vetting this week at a meeting of the 194-nation body in Kampala, Uganda. 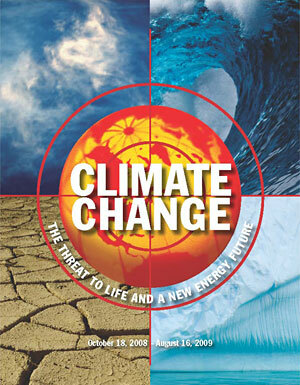 UN Secretary-General Ban Ki-moon drove home the "be prepared" message at a climate forum in Dhaka on Monday. "Natural hazards need not cause human catastrophe," he said. "There are many cost-effective remedies that communities and countries can take to reduce the impact of extreme weather events." Poor countries with scant margin for manoeuvre will be hit first and hardest. But the 2003 heatwave that killed 70,000 in Europe and Hurricane Katrina's flooding of New Orleans are deadly reminders that rich countries must brace for impacts too. And beyond a certain threshold, the report cautions, all efforts to adapt may be overwhelmed unless the underlying carbon emissions that drive global warming are held in check. Three years in the making, the special report -- based on thousands of peer-reviewed scientific articles -- is the IPCC's first dedicated probe of the nexus of climate change and extreme weather events. It is also the first time the panel has woven climate science and risk management into a single analysis. Since the IPCC issued its inaugural assessment in 1990, "historically distinct research communities" have worked independently and produced separate reports. That segregation was probably a mistake, experts on both sides of the divide told AFP. "Disaster specialists have a world of experience that should be an essential baseline for adaptation to future climate change," said Tom Downing, head of the Global Climate Adaptation Partnership in Oxford and a veteran of the IPCC process. "It is encouraging to see the IPCC take forward this integration in a groundbreaking assessment." "One of the key take-home messages of this report is the emphasis on exposure and vulnerability," agreed Will Steffen, head of the Australian National University's Climate Change Institute. "Science is only part of the puzzle here. The others have to do with people's resilience and adaptability." Neville Nicholls, a professor at Monash University in Melborne and a lead author of the pure-science chapter on how climate change affects weather, said the collaboration "strengthened us both." "It has made the scientists focus a lot more on what the risk community really needs, and the disaster risk community have a better idea of what we can -- and can't -- give them," he said by phone. The change in tack follows several reputation-damaging mistakes uncovered in the IPCC's landmark Fourth Assessment Report in 2007. Most of the errors, including a wildly inaccurate estimate of the pace of glacier melt-off in the Himalayas, stem in part from poor coordination between these communities, IPCC scientists acknowledge. The new, solution-oriented report, identifies relatively easy and cheap "low-regret" actions such as early warning systems in areas likely to be hit by deadly heatwaves or flooding. Improved building codes and forecasting capacity could likewise help save lives in cyclone-prone regions. But the longer such measures are put off the more costly or ineffective they become, it cautions. Many adaptation schemes have already been put in place, especially at the local level. Newly-planted mangrove forests in Vietnam, Cambodia and Myanmar help break the destructive force of cyclones jacked up by warmer and rising seas. And new heat-resistant strains of corn, rice and beans could save thousands of lives. More than 350 million worldwide people face a "perfect storm" of conditions for potential food disaster, according to the Consultative Group on International Agricultural Research (CGIAR). Sometimes there may be not "options" at all -- citizens of several small island states face permanent relocation due to rising seas, the report said.